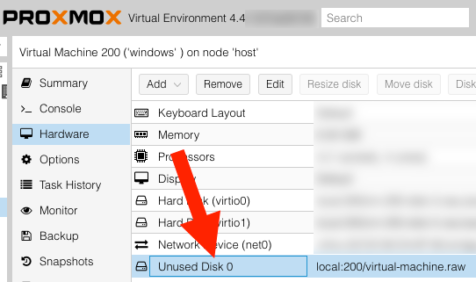 It’s trivial to create virtual disks in Proxmox, but what if you want to add an existing disk to a new virtual machine? Obviously the disk image should be in one of the formats supported by Proxmox, such as qcow2 or raw. Use qemu-img convert to convert between formats. In my experience, Proxmox doesn’t always detect the new disks automatically. Save the file and simply reopen the Hardware tab in Proxmox. Once the new disk image shows up as an unused disk, you can double click on it and configure it for use with the virtual machine. This entry was posted in How to’s and tagged proxmox, virtualization. Bookmark the permalink. 1) cant put my images on: /var/lib/vz/images because the disk is full but i have much space on /backups/images how to Proxmox recognize it? and 2) i go to /etc/pve and i have empty folder…. exist but empty.